A project that I’m working on here at The Jeopardy! Fan is to keep track of everyone who had lost a game on the show, but was then invited back (usually due to being disadvantaged by a faulty clue, but there have been other reasons as well). As it stands now, this is certainly not an exhaustive list, but I’m working on it! If you have an example that is missing, please send an email with details (you can find contact details at this link) and I’ll add it to the list! Click or tap on the name/date in order to bring up details; the returnees are in reverse chronological order (most recent at the top of the page). Vincent Valenzuela was leading going into Final Jeopardy! on July 13, 2018, but there was a technical issue with Final Jeopardy (in that the in-studio screen read “his” and not “this”, prompting Vincent to give an incorrect response.) The Chicago Tribune reported that Vincent was invited back. 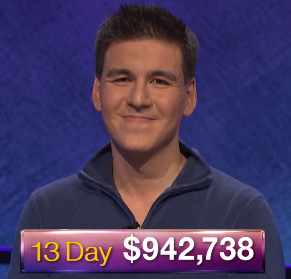 When going for his fifth win on February 2, 2018, Ryan Fenster was originally ruled incorrect on this ROAMIN’ CATHOLICS $1200 clue: St. Thomas Aquinas died traveling to Lyon, France while attempting to heal this rift between the Latin & Greek churches (saying “What is the Great Schism?”; the show wanted “What is Schism?) As the ruling ended up costing him the game, and was later deemed to be incorrect, Ryan was invited back on the July 17, 2018 episode. Rebecca was in second place on 2018-01-11 and saw the following Final Jeopardy! clue, in THE MOVIES: “It’s the first Oscar nominee for Best Picture to be produced by an Internet streaming service”. The intended response was “Manchester by the Sea”, and she failed to respond correctly. Ashley was in second place on 2015-12-29 and saw the following Final Jeopardy! clue, in FAMOUS LAST NAMES: “The first woman space shuttle pilot shares this surname with a man on the 1st manned lunar landing 26 years earlier” Ashley failed to respond correct, betting all of her money and finishing the episode in third place. However, at the end of the episode, Alex recorded a statement saying, “Our bad, folks. Today’s Final Jeopardy should have referred to the entire Apollo 11 mission rather than to just the lunar landing part of it. We feel that Ashley might have been disadvantaged and so we have invited her to return to play again later this week.” She returned to win on 2015-12-31. Scott’s original appearance in 2009 was marred by a Final Jeopardy (CLASSIC SONGS FROM MOVIES: 6-word title of the song that says, “For the house fell on her head & the coroner pronounced her dead”) where it was contended that the lyrics in the clue weren’t actually mentioned in the movie. The show agreed, and brought Scott back for another opportunity. Unfortunately for Scott, the other challenger in his second appearance: Roger Craig. Scott finished in a distant third place in his return on 2010-09-13. In her second appearance, Kori responded to her Final Jeopardy (ALPHABETS: In the phonetic alphabet used by the U.S. military, it’s the only letter that has the same name as a warrior people) with the letter Z instead of Zulu. Eventually, the show agreed that the two responses were equivalent and she was brought back. She finished second to Ben Auer in her return. As the returning champion, Tom lost to Paul Thomas in game #5454, aired 2008-05-01, but because Alex Trebek gave Paul a little extra time to write down his winning Final Jeopardy! response on the backup paper card after Paul had trouble using the electronic tablet, it was determined that Tom may have been disadvantaged and should return. In #5455, aired 2008-05-02, Tom was again at the champion’s podium and Paul took the middle podium. In that game, Tom defeated Paul and went on to play again, eventually winning 4 games and reaching the quarterfinals of the Tournament of Champions. “Matt Sojot [see below] and Karla Sortland lost from second and first place respectively on this clue, in the category PORT CITIES: “It was Russia’s third-largest city until it became the capital of an independent republic in 1918″ Only returning champion Tricia Barreiro got Riga, and Karla and Matt guessed Odessa and Kiev. According to his player page at J! Archive, Matt objected to the ruling, saying the clue was ambiguous enough to make Kiev a potentially correct response, and they opted to bring both players back as a result.” Karla finished second in her return, to Susan Mitchell. “Matt Sojot and Karla Sortland [see above] lost from second and first place respectively on this clue, in the category PORT CITIES: “It was Russia’s third-largest city until it became the capital of an independent republic in 1918″ Only returning champion Tricia Barreiro got Riga, and Karla and Matt guessed Odessa and Kiev. According to his player page at J! Archive, Matt objected to the ruling, saying the clue was ambiguous enough to make Kiev a potentially correct response, and they opted to bring both players back as a result.” Matt finished in third place in his return. “Holly Owens and Brian Lamb [see below] were contestants in the game when Bob Mesko was brought back [see below], and they lost on a triple stumper FJ about actors that had been nominated for Oscars in each the last five consecutive decades. The clue was looking for Jack Nicholson and Michael Caine, who were each nominated in the ’60s, ’70s, ’80s, ’90s, and ’00s. But Holly and Brian both said Paul Newman, who got nominated during each of the five ten-year periods from 1956 to 2006.” In her return, Holly defeated Cathy Lanctot en route to winning two games. “Holly Owens [see above] and Brian Lamb were contestants in the game when Bob Mesko was brought back [see below], and they lost on a triple stumper FJ about actors that had been nominated for Oscars in each the last five consecutive decades. The clue was looking for Jack Nicholson and Michael Caine, who were each nominated in the ’60s, ’70s, ’80s, ’90s, and ’00s. But Holly and Brian both said Paul Newman, who got nominated during each of the five ten-year periods from 1956 to 2006.” In his return, Brian lost to eventual 5-time champion Cathy Lanctot. A poorly-worded Daily Double that cost Bob his fourth game (“Fitting name of a unit between group & division, like the 509th Bomb one or 349th Air Mobility one”) resulted in his return to the show a few months after his first appearance. He went on to win two more games in Season 22, reaching the semifinals of the year’s Tournament of Champions. “Leslie Burns-Dell’Acqua was in a distant but not hopeless second place when she encountered this FJ in DATES IN AMERICAN HISTORY: “On this date Philadelphia partied with fireworks & music from a Hessian band captured 6 months earlier” Everyone missed, and the player in first place held on to his lead. But Leslie’s FJ thought process, as she explained in her blog first went to the first Independence Day celebration, but then the clue’s “six months earlier” gave her pause, since the capture of the Hessian band would have been on Christmas day 1776. So she added six months to that to get her response of June 25, 1777, only to find out that July 4, 1777 was indeed what they were going for.” On her return, Leslie finished in second place to Maria Wenglinsky. “[In Frank Amanat’s original game], he led entering FJ. The category: CANDY. The clue: “This person after whom a candy bar may have been named was part of a family on an 1892 Election Day souvenir medal” He responded “Who is Cleveland?” and was ruled incorrect, after third place was ruled correct on ‘Who was Baby Ruth? '” Frank returned a couple of months later and won three games. Tom Nichols was a four-time champion who lost his fifth game in early 1994. He was brought back in November; as he says in his Ultimate Tournament of Champions bio, he was determined to have been right on a question where he had been ruled wrong. He won in his return, becoming a five-time champion in his sixth game, just in time for the ToC (which he would have qualified for anyway). Neither game is archived. In her original appearance, India was leading going into Final Jeopardy (SHAKESPEARE: Character who says, “The evil that men do lives after them”). India lost, but was brought back in December of 1991 to win 5 games. Her most recent appearance was in the Battle of the Decades. 2016-01-13 Updated information from Stefan Goodreau on Scott Wells, added Kori Tyler, Arianna Kelly, Karla Sortland, Matt Sojot, Holly Owens, Brian Lamb, Leslie Burns-Dell’Acqua, Frank Amanat. More to come! 2018-07-16 Added Season 34’s Rebecca Zoshak, Ryan Fenster, and Vincent Valenzuela. Added information about Tom Nichols from Stefan Goodreau.